Kaida Kogen is famous for its soba noodles and Kiso uma (horses). The grandeur of Mt. Ontake is seen from anywhere in the area. Mt. Ontake is a sacred 3067m tall mountain. You can enjoy a range of activities, such as hiking and mountaineering using Ontake Ropeway. ※ Runs from late May to early November. Ropeway & bus discount ticket available. Tsumago-juku has been restored to its appearance as an Edo-era post town and is now a popular tourist destination. ※English map is available at the tourist information center. There are many places to eat, drink, and stay. Magome-juku was one of the eleven Kiso post station. The homes of the residents were built on low stone walls along either side of the slope. 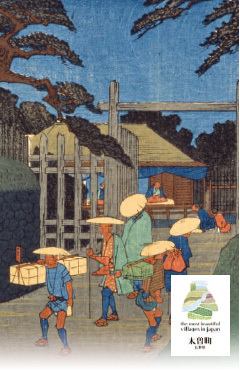 Narai-juku is town from the Edo period. It continues for about 1 km and old row of houses are saved. The dignity beyond a time is felt. Here is Yoshinaka-Yakata museum. It explains the tragic life of Kiso Yoshinaka, a general in the 12th century, with pictures and dolls. 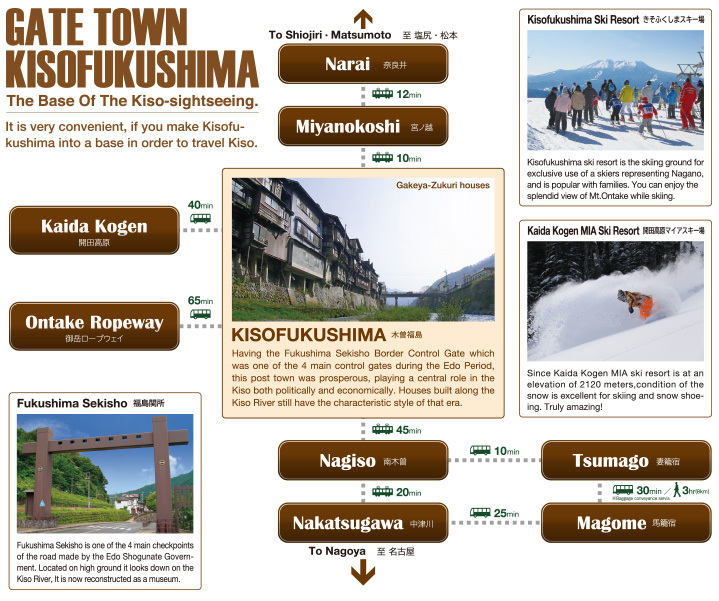 Kiso tourism begins from JR Kisofukushima Station. Copyright (C) KISO TOWN All Rights Reserved.